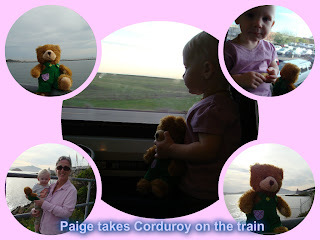 Corduroy’s Adventures with Paige began with a train ride with her Mom and Dad to her Grammie’s house. They took Grammie’s race car to the bay area, stopping on the way home for Meatballs with Loganberry sauce for dinner. Paige says that they had such a fun week together! "A Visit from Corduroy" is part of the Clovis Family Storytime.